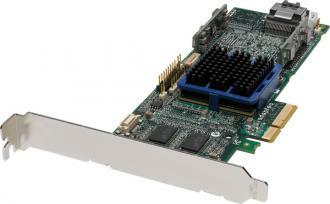 Affordable Unified Serial RAID controllers support both SATA and SAS devices. Ideal for workstations, and entry to mid-range servers. Affordability and performance with an advanced feature set for customers needing storage flexibility and capacity growth. 873,402 hours at 40 degree C.
Choose an Adaptec Unified Serial™ controller to leverage cost-effective, high-capacity Serial ATA (SATA) disk drives or high-performance Serial Attached SCSI (SAS) drives, or both, in a single storage system. With Adaptec Unified Serial controllers, you can scale up to 60TB (using 500GB drives) and increase performance for SATA and SAS storage. The Adaptec RAID 3405 is a 4-port controller that supports SATA and SAS drives and next-generation PCIe connectivity. It features Adaptec RAID Code (ARC) with RAID levels 0, 1, 1E, 5, 5EE, 6, 10, 50, 60, JBOD, as well as Copyback Hot Spare and Optional Snapshot Backup. With an MD2 low-profile form factor, this card will fit into any server, including high-density rack mount and blade servers. The card has 128MB of DDR2 memory and a battery unit is optional.Adaptec Storage Manager™ provides one-view, centralized management for all Adaptec RAID controllers.